Both of you have been enjoying your new Chanukah presents over winter break. Of course, you do appear to have favorites. To celebrate 2010, we went to Nana & Papa’s house for breakfast. Before leaving, we packed up some items to take with us. Along with Piggy, JSL, you wanted to take your Pupberry (aka the LeapFrog Text & Learn). NHL, you immediately asked to take your LeapFrog Didj and games. When breakfast was over, we decided to watch the parade on television. After a short amount of time, the two of you were pretty bored with the events. Sure it was beautiful, but it was not Disney characters like the parade on Christmas. NHL, you took your pillow and propped yourself onto the ground to play your Didj. JSL, you were a little copycat. You demanded a pillow and quickly took your Pupberry out. The two of you were concentrating on your learning so much that everyone said it was a special moment. That signaled me taking out my camera. 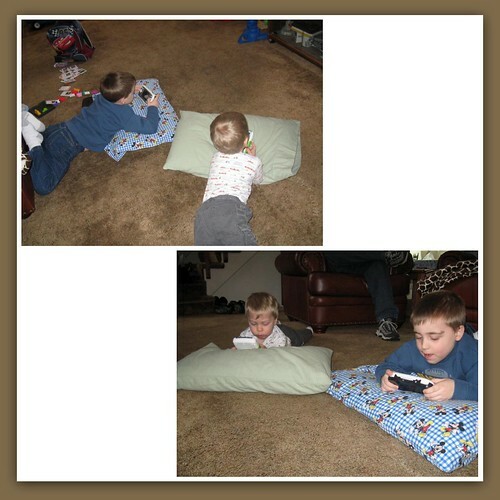 It was so sweet watching both of you together, quietly playing and enjoying your new toys. Hopefully, you will continue to enjoy these and other items together. .-= RobMonroe´s last blog ..2009 Blog Review =-.